Do you like this work? Yes, very much. 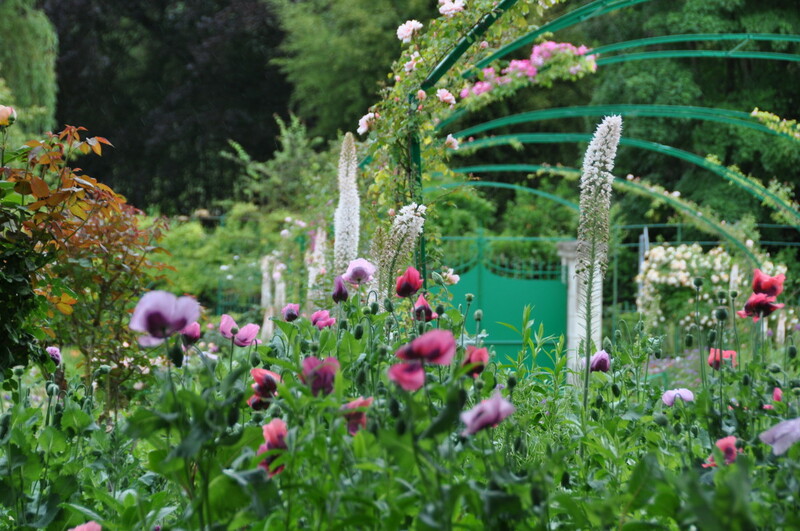 It’s very special to be able to work in Monet’s garden for a month. I have the opportunity to see how the flowers change in the garden as we take certain flowers out and put new ones in or as new ones pop out of the ground. I feel lucky to be able to soak in the garden’s beauty each day. Additionally, I love the opportunity to visit the garden after hours. It is sometimes challenging to be working outside all day, but I am thankful for the opportunity. I knew previous students from Davidson College who had completed the internship and they had all loved the experience. It’s a great way to practice speaking the French language, experience French culture, and explore the region on weekends. It’s also an excellent way to reflect on one’s life and journey thus far. As I’m working in the garden or going on bike rides in the area, I have the space to think about what has been meaningful in my life so far and what I would like to do in the future. Working in the garden is fun! I enjoy talking to the tourists, especially when I’m able to practice French with them. Many of them ask me for the names of the flowers, but usually they know more of the names than I do! 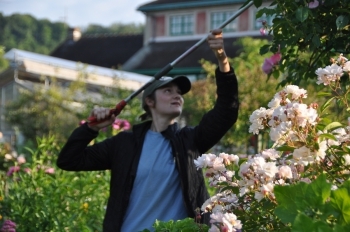 Also it has been enjoyable getting to know the professional gardeners, who really make the magic happen in the garden. I’ve enjoyed joking around with them as I have gotten to know them better. Over the main alley that crosses Monet’s garden, the climbing roses display their tender colors in June. Their pink and red match the pretty colors of the annual poppies scattered everywhere in the flower beds. 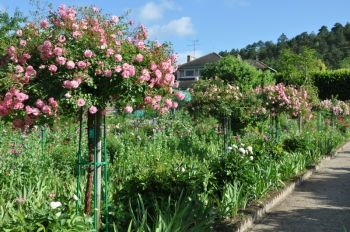 Just an idea of the profusion of roses blooming in June at Giverny! For a few weeks, Monet’s garden becomes a rose garden. 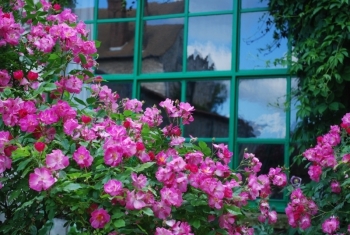 Rambling, climbing roses climb on dozens of metallic structures, typical for a garden designed in the 19th Century. After the yellow and orange Iceland poppies, and the enormous red perennial Chinese poppies, it is now time for the lovely pink annual poppies. 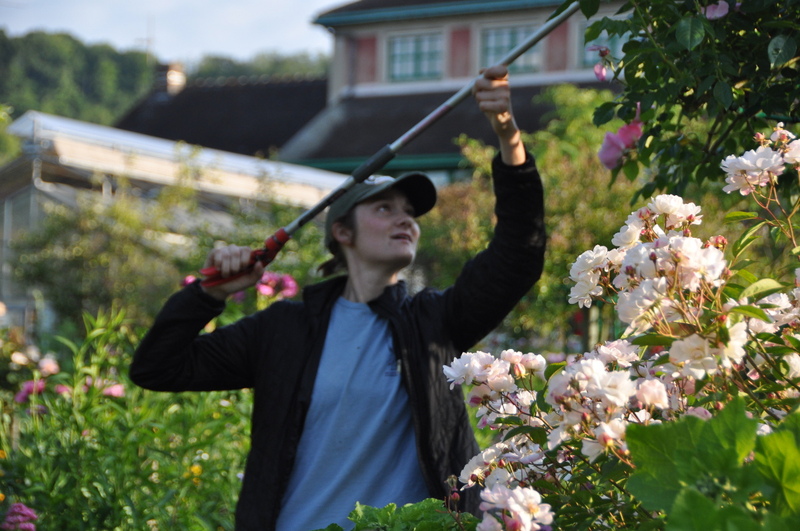 Each year, when they pull the dried ones out of the ground, the gardeners scatter the seeds in the flower beds. They grow everywhere, and they turn the garden into a pink fairy for a few days. 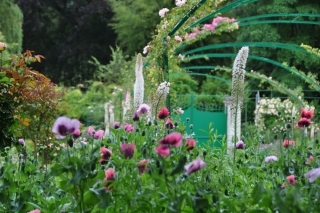 The eremurus, also known as fox tails, create an interesting contrast with their vertical shape. They are topped by the climbing roses, at their best in June. Standard roses are one of the beauties of Giverny. As tall as trees, they measure over 2 meters and they offer their pink blossom like enormous bouquets. 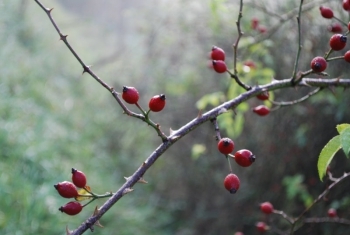 Rose trees are generally not strong enough to resist wind, so they are grown on metallic structures that look like umbrellas or mushrooms, according to your imagination. Some people call them weeping roses, that’s really too sad. In Monet’s flower garden, they tower over big bunches of peonies and large flower beds of pink and red poppies. 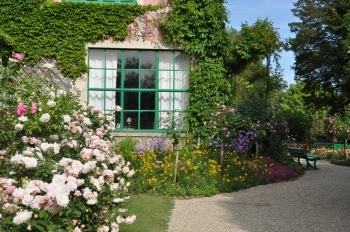 A purple bush rose frames the big window of Monet’s first studio at Giverny. 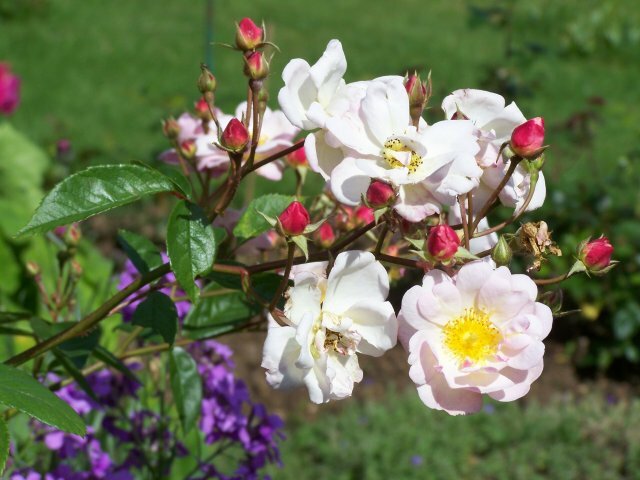 Purple roses are not very common, nor look very natural, but they provide a strong impact. This one has a sweet name: lavender dream. It is lovely in springtime when it flowers in numerous small simple roses. 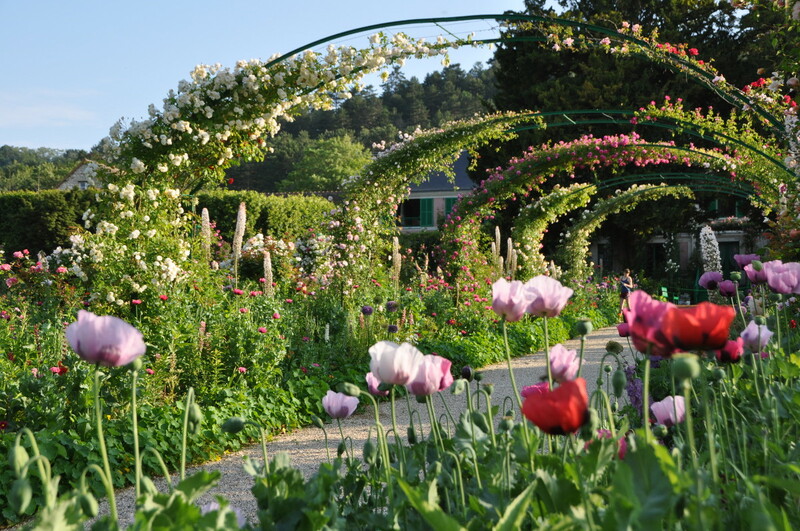 It is too late now for roses, but it is the right time to see -and smell- lavender in bloom at Giverny, as a slight reminiscence to Provence. It perfumes the air, together with phlox and lilies. 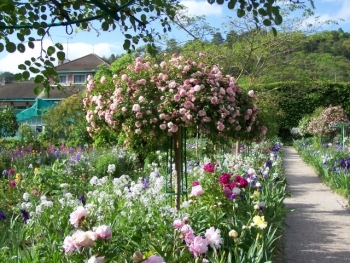 Monet’s garden at Giverny is full of roses. It is not a proper rose garden, for there are also many other sorts of flowers, but nonetheless it is gorgeous in May and June when the roses are in bloom. All sorts of colors can be seen, pale cream, pure white, soft yellow, many pinks, red, orange… Not all of them are simple roses but many are scented. Light and delight. 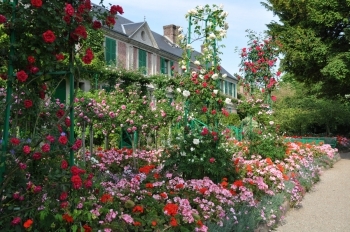 Claude Monet preferred simple roses, with one row of petals instead of more complicated double roses. 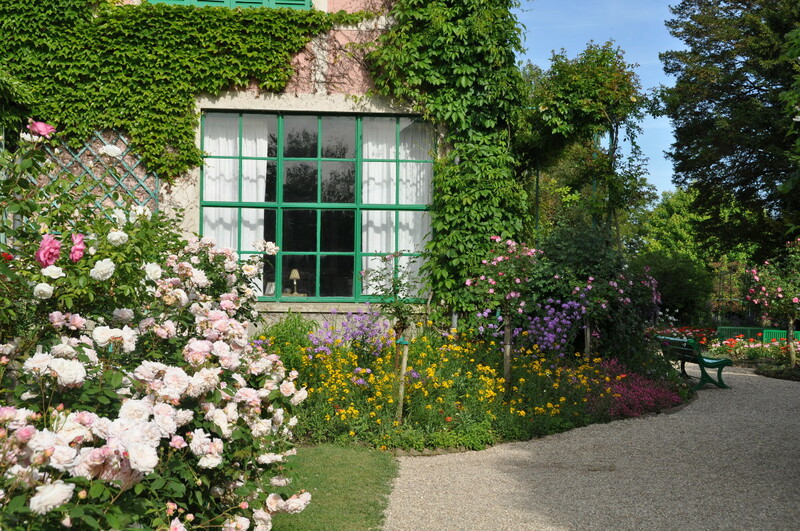 Double flowers with many petals seemed too sophisticated for his garden located 80 km from Paris in the small village of Giverny, in the middle of the countryside. 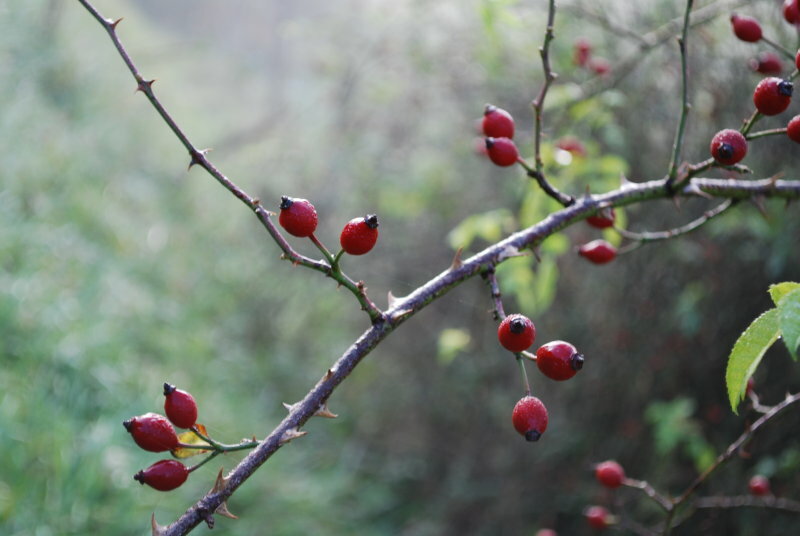 Simple roses look like the wild ones which are currently in bloom in the fields. 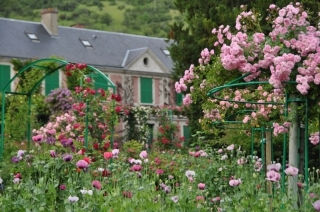 In the same range of ideas Monet didn’t consider all the wild flowers like weed. He accepted many of them among the cultivated ones. They give sort of a countryside touch to his flower garden.